This radical experiment is at the heart of Davidson's inspiring new book. Using cutting-edge research on the brain, she shows how "attention blindness" has produced one of our society's greatest challenges: while we've all acknowledged the great changes of the digital age, most of us still toil in schools and workplaces designed for the last century. Davidson introduces us to visionaries whose groundbreaking ideas-from schools with curriculums built around video games to companies that train workers using virtual environments-will open the doors to new ways of working and learning. A lively hybrid of Thomas Friedman and Norman Doidge, "Now You See It" is a refreshingly optimistic argument for a bold embrace of our connected, collaborative future. Cathy N. Davidson codirects the annual HASTAC/MacArthur Digital Media and Learning competitions. She holds distinguished chairs in English and interdisciplinary studies at Duke University and has published more than a dozen books. She lives in Durham, North Carolina. “[Davidson] makes a provocative case for radical educational and business reforms. . . . Davidson's call to experiment with digital schemes that turn students and workers into motivated problem solvers rings as clear as a bell atop a little red schoolhouse." 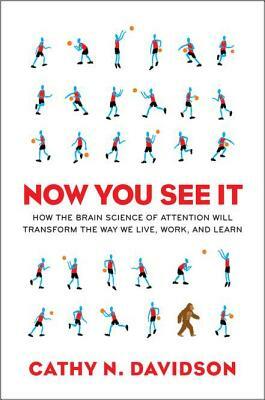 “Davidson's claim that mono-tasking (the idea that a person can focus on one single task at hand) is an unrealistic model of how the brain works, seems strikingly persuasive. Davidson also calls for a reform in education . . . [that] helps kids become multitasking, problem-solving thinkers." “The technological changes around us are of unprecedented proportions... In this book Cathy Davidson integrates findings from psychology, attention, neuroscience, and learning theory to help us get a glimpse of the future and more importantly a better understanding of our own individual potential." “Now You See It is simply fantastic. Only Cathy Davidson could pull off such a sweeping book. It is about so much more than just education or even learning. It is about a way of being. Her book and stories are incredibly important for the true arc of life learning and for constantly becoming!"